Aloe vera has been known for a long time, but only e few people know the benefits of this plan. Aloe vera is derived from Africa. These plants can grow in arid regions like Africa, Asia and America, because this plant can close the stomata during the dry season to avoid water loss from leaves. Aloe vera can also grow in cold climate. The weakness if planted in wet area with high rainfall is susceptible to fungus. Within aloe contained some substances that are very good for beauty treatments and medications. 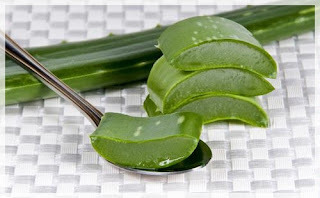 You can try natural medicine of aloe vera at home, It's more healthy and simple. Wash and peel aloe, then cut into small pieces or blended. Add 1 tbsp pure honey, and drink it 3 times a day. Half leaf aloe washed, peeled and shredded. Add half glass of water (100 ml) then squeeze. Add 2 tbsp honey, drink while warm 3 times a day. 2 leaves of aloe, washed, peeled, cut into pieces and add 3 glass of water (500 ml) then boil until the juices of aloe vera mixed. Strain and then drink half a cup 3 times daily after meals. Rub aloe vera to the head, then wrapped in warm towels. After 3 hours wash hair. Do it every day. Cut a few thick fleshy leaves at the base near the steam, rinse the cut part of the leaf thoroughly, peel off outer layer of skin. add lemon squeeze to stabilize the gel add a little purified water. I like aloe vera. I grow a plant in my home too. It is very useful!